Schoolhouse No. 9, or Woodbourne School, is still in use as a brick residence at 5683 Mad River Road, It is the third building used in district No. 9. 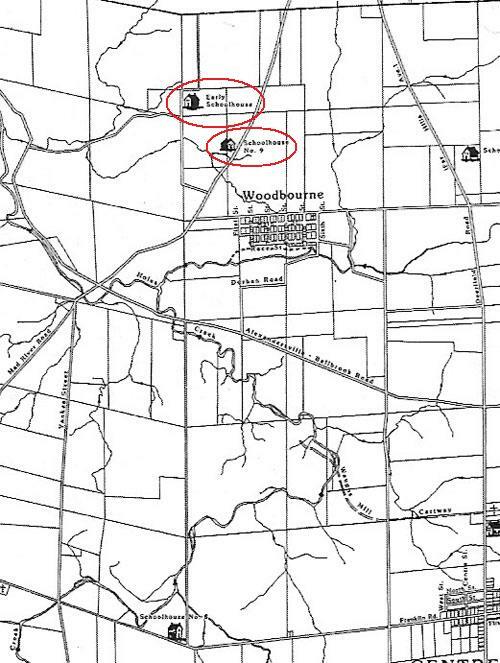 There were two earlier schools in the area, one on Munger Road at the township line, and one on W. Rahn Road. 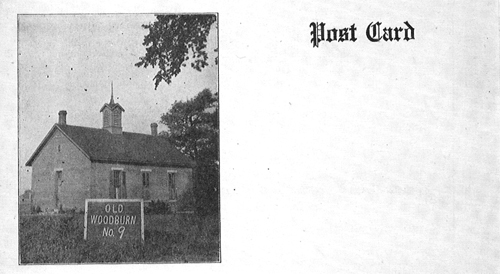 This school served children as far north as Stroop Road. Consequently, it was necessary each year to appeal to the Van Buren school board for their proportionate share of the costs. Mrs. Mary Gerhard Creamer was the last teacher to provide instruction to some 30 children in the eight grades during the last five years that No. 9 served as a school. 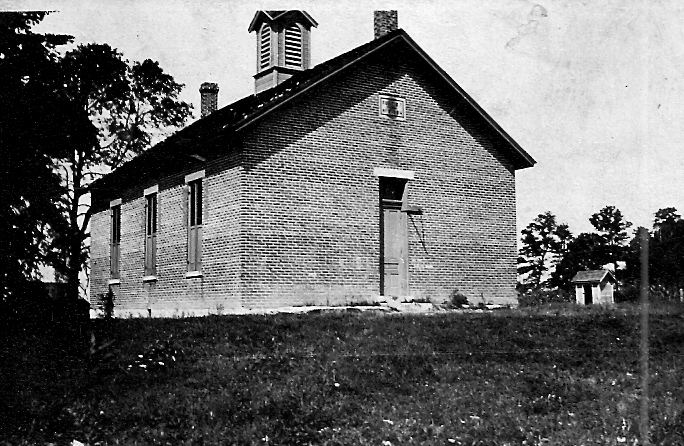 The school measured 30 by 40 feet, had three windows located on either side and a door in the center on the east side, facing Mad River Road. The floor was yellow pine. A blackboard ran across the west end, and there was shelving from the corners to the windows. A built-in platform stood at the front of the room providing an elevated position for the teacher's desk, and also served as a stage for plays and skits. A small pump organ near the platform provided the accompaniment for singing. A recitation bench for spelling bees and other lessons sat in front of the rows of student desks. The desks came in three sizes to accommodate the various ages and sizes of the children and stretched in long rows to the rear of the building, bending around a black coal stove in the middle of the room. Coal for the stove was stored outside in a small shelter and it was the duty of one of the older boys each week to carry coal inside and to feed the stove. Lighting on cloudy days was furnished by kerosene lamps. There was no inside plumbing. Two small outbuildings were provided at the rear of the school, and there was a hand pump outside for a source of good water. 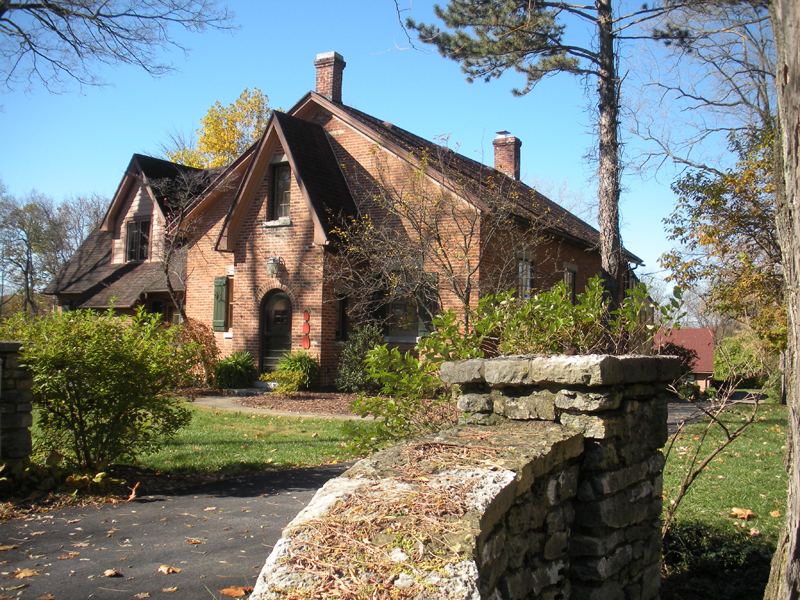 In the 1940s, the Bohachek family bought the schoolhouse and turned it into living quarters. They added the front gable and the bedroom wing, turned the stables into a guesthouse, the caretaker’s house into a summerhouse, and built a swimming pool. In 1983, the Steinbrunners bought the house and were married there. They gutted the kitchen and both bathrooms. Walls were removed; plywood covering the original wainscoting and chalk rails was removed. The guesthouse and the summer house were restored. The pool has been covered with a large deck. The old pond has been lined and adorned with a waterfall. Our archives show that two Big Reunions were held. One was August 30, 1919 and one was August 25, 1923. A.O. Yike, Cora Himes, and Harry D. Wheatley were the organizers of each. All that had attended Schoolhouse No. 9 were invited and those whose addresses were known received a postcard with needed information. A newspaper article announced that... "after an interval of several years a big reunion of former teachers, pupils and friends of the old Woodburn school, District No. 9, Washington township, was held on the school grounds recently. About 200 were in attendance, seven or more states being represented. Interesting letters were sent by many living at a distance, who were unable to be present. Ideal weather and a bountiful dinner put everyone in fine spirits. A general roll call brought hearty responses and remarks. Interesting and amusing incidents of long ago were related by some, whose memories reach far into bygone school days. A liberal offering was made to defray expenses and to provide for a goodly sum which was presented as a token of esteem to a former teacher, F. E. Ferris, who had come all the way from Georgia to be present on the occasion. Personal greetings of old-time acquaintances seemed to shorten the hours." There is no note about who gave this introductory announcement... Four years ago, on these school grounds that are still dear to memory, quite a number of the former teachers and pupils of old District No. 9, Washington Township, met in a "Woodburn School Reunion." Time is sure to bring changes, even if no greater than to add a few more "crows' feet" near the eyes, and a few more gray hairs in locks that once had no gray at all. It is fitting that for a school reunion, all living persons who have ever been connected with the school should be included in the invitation. But, some who were most familiar with that part of the history of this school famous for the school exhibitions that were held, think at once of the teacher and pupils who were so well known then, and of the amusing characters represented in those old-time entertainments. The teacher, F. E. Ferris, is here today. A. L. Wheatley, of Tennessee, one of the pupils of that time, is present, also. We hope there are others from a distance of whom we had not been informed. For a while in that period of the school's history, the enrollment was more than one hundred - two in a seat, side benches occupied, and perhaps some disorderly children standing in corners. When we think of the fact that nearly half of that number are dead and gone from among us forever, we are apt to ask ourselves...can it be?! And as we think of those who are living, we may also ask...who'll be the next? But what does it matter, after all, if only we're ready when He shall call? Since the last school reunion, two of the former well-known pupils of this school have crossed the "great divide" between this world and the world unseen by mortal vision: Ella Rahn Wheatley, and Ida Rahn Brelsford, sisters who meant so much to each other in life, and who in death were not long separated. Several others who died recently were connected with this school a little farther back in its history. Of these we recall Frank Pope, W. R. Wheatley of Sidney, Ohio, Mrs. Martha Miller Watkins of Centerville, Ohio, and T. J. Keating, prominent attorney of Columbus, Ohio. (Ask for others) [at the end of the written speech, someone wrote John Kress, Ezra Whipp, and Wesley Morris. Perhaps these were names that the audience offered. Let us so live that when the call comes for us that it may be to join in the great reunion above where farewells are never spoken. My Dear Pupils and Friends. I am surely glad to be with you today; to take you by the hand and look into your dear faces. How many thoughts pass through the mind. What memories of the past rise up before us. Many are the years since we were associated together as pupils and teacher. It seems but yesterday since we were learning the lessons in the old schoolhouse, or playing our games on the old school grounds. But many years have passed since then and I realize that we are growing older. On many heads there are "silver threads among the gold." I too am growing old. I have passed my "three score years and ten" and I know that I must soon lay down my armor and join those who have gone before. There are feelings of sadness mingled with our joys today for we miss many who met with us in days gone by. They are not with us today. They have finished their work and passed over to the other side... but they are not forgotten. Their memory is still held in loving remembrance. Time and tide wait for no one. In a few years we who have gathered here today must lay down our burdens and pass over the Dark River. Let us make the most of the time that is left us. Remember that our lives are what we make them, whether replete with good or filled with evil. We may make our lives a blessing to ourselves and to those around us; we may make them a bane and a dishonor to the name of man. Let us remember that this life is not all - that there is a life beyond the grave - a life eternal. Let us be prepared to live here and then we shall be ready for the life to come. I care not what we may have accomplished in this life; how successful we may have been in temporal affairs, if we have not given our hearts to Christ and taken Him for our Savior and Guide all has been lost and life with us has been a failure. I have been teaching in common, graded, and high schools for nearly fifty years. 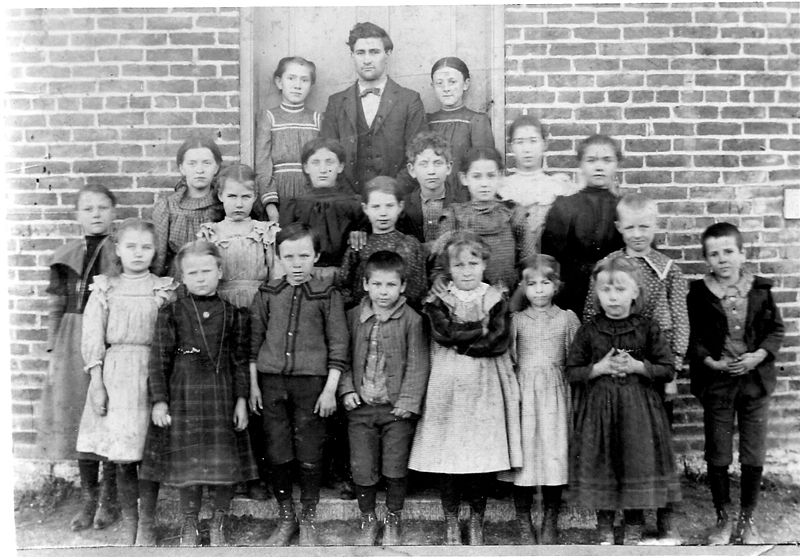 I have taught in five states of the Union; Ohio, Indiana, Michigan, Tennessee, and Georgia, and of all the schools I ever taught the school at Woodburn was the most pleasant. The school was large, over 100 pupils enrolled; the work was hard, and yet I enjoyed it. I had over twenty large boys and girls - young men and young women. The pupils were studious and obedient and it was a pleasure to teach them. Those happy days are gone, never to return, all that is left us is their memory, but their memory is sweet. We shall never all meet again on earth, but may we so live that when our life here is over, we shall all meet in a glad Reunion beyond the skies where parting is unknown. May the dear Lord be with you and keep you is the prayer of your old teacher and friend. In the days of the endless year." Woodbourne Schoolhouse No. 9 as it appears today. A class photograph at Woodbourne School. Walter Hibberd is the teacher. This is your invitation to one more Big Woodburn School Reunion of all living Teachers, Scholars, and Friends, Saturday August 25th, at the Woodburn School Ground. Possibly a last chance to meet School Mates and Friends of years gone by. Mr. Ferris is now here and will be with us. Basket dinner at 1:30pm. Autos will meet the Dayton Brown Street Cars 11:30 am to 1 pm, round trip 25 cents. Don't miss this Reunion! Get the word to every Teacher and Scholar you can, for we can not reach all by these invitations. If you cannot come, please write a letter to the Secretary to be read at this Reunion.